IBM introduced Lotus Notes 8.5 at Macworld Expo, a new version featuring integration with social calendaring Web sites. The company also released a beta version of Lotus Symphony, a free productivity software suite that includes document, presentation, and spreadsheet capabilities. Lotus Notes 8.5 is the most recent release of IBM's collaborative software for enterprise. The new release features a more user-friendly look and feel that arranges collaboration tools in fewer clicks—links to team rooms, instant messaging, To Do lists, calendars, and other content are all provided. Notes 8.5 also employs integration with Google, Yahoo, and many other "public Internet calendars," according to IBM, enabling Notes users to share content with non-Notes users. And the updated iNotes 8.5 lets anyone with a Notes license access Notes using a Safari Web browser, with integration for features like the ability to map street addresses in e-mail notes. Lotus Symphony is IBM's long-running integrated software application, now available on the Mac for the first time. The 1.2 Mac beta is available for free download from IBM's Web site. 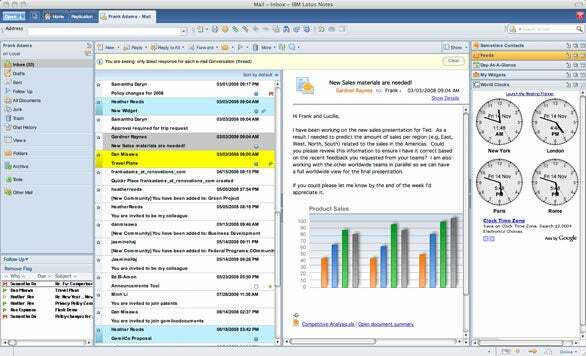 Lotus Notes 8.5 features an updated interface. Symphony combines a word processor with spreadsheet and presentation software; it supports OpenDocument Format (ODF) and can export files in PDF format as well. The software is based on OpenOffice.org, but uses IBM Lotus technology as well. System requirements for the Lotus Symphony beta call for an Intel-based Mac running OS X 10.5 or later, 540MB free hard drive space, and 512MB RAM.